On the foggy morning of 27 July 1986, the Southern Michigan Railroad Society’s ex-Ann Arbor Railroad RS-2 #303 has come to life. Pushing dead sister #301 and Jim Frye’s ex-GTW caboose, the veteran Alco has crept north for the first time along the tracks of the SMRS’s ex-Clinton Branch line, from its storage point at Demlow Road, to just south of the missing diamond with the Norfolk Southern Railroad at Raisin Center. Within the next hour, N&W steam locomotive #611 will itself appear out of the fog, headed from Detroit to Ft. Wayne, IN with the Bluewater Michigan Chapter’s “Ft. Wayne Flyer” excursion train. Number 303 will be giving a horn salute to #611 as it passes. The previous day, the locomotives had also greeted the 611. This was the only time an SMRS train ventured over this part of the line. The rails remain in place to this day, overgrown and unused. 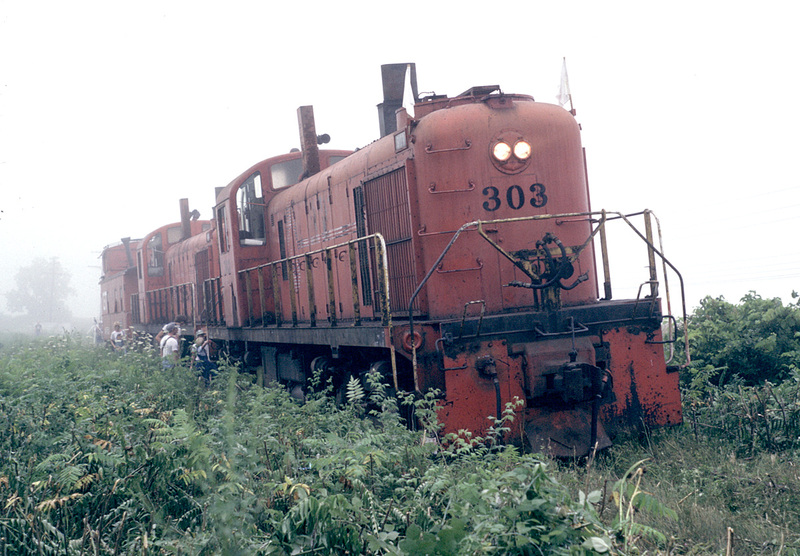 Number 303 would repainted two months later in its guise as New York Central #8203, to take part in the 150th anniversary of the Erie and Kalamazoo Railroad in Blissfield. It would see little use after that, and a few years later both Alcos were sold into private ownership and left the SMRS.